Here is part one of my Lennar Review on the consumer website Pissed Consumer. Are you a homeowner with a Lennar complaint? I highly recommend submitting one of your Lennar reviews to this website. I was recently contacted by the consumer review website, Pissed Consumer, to talk about my experiences with Lennar Homes. The video of part one of my Lennar review is below. I’m also including the transcript in case you would rather read the review. The interview was based on a Lennar review I left on the website and can be found here. If you are having issues with Lennar, I highly recommend submitting a review to Pissed Consumer. If you are thinking of buying a home, I also highly recommend reading all of the Lennar reviews on the site as well. You’ll quickly see a pattern. (Note: I am adding links to the transcript to provide you with more context). I contracted for a new construction home in 2012. On May 15, 2013, I closed on a [Lennar] new construction home in the Westshore Yacht Club in Tampa, FL. From the very beginning, it’s been an absolute disaster. I have currently – 4.5 years into it – I have 80+ construction defects so severe I cannot even list my property for sale. My home is making me sick, I don’t want to be here, but there is really nothing I can do if I can’t sell it. The estimated cost of the Lennar construction defects is well over $200,000. That includes – so for example – I have two A/C units. Between those two A/C units – in four years – I’ve had 25 A/C outages. These A/C malfunctions have caused flooding in the house, have caused mold throughout the house in both locations and the Lennar builder knows about this. In fact, in early November, Lennar was contacting me specifically about the A/C units because they know they’ve been causing health issues they know both of them have been causing mold and flooding. Lennar agreed to replace both A/C systems and I have all of the communications. And these are not just front-line employees, these are senior executives at this company. The Lennar Director of Customer Relations [Jim Yeadon] at that point reached out to me. We went back and forth and then we had Hurricane Irma which delayed some things. But then I never hear anything. The last thing I addressed was several months before I had meetings and inspections all the way up with the Division President of Lennar [Mark Metheny] who had promised a whole bunch of water damage and mold remediation would be done from both A/C units that are defective as well as roof flashing that was improperly done and has caused roof leaking on both sides of the house. I sent a list that happened off of our last conference call of all of these mold remediation and water damage points that these executives had promised to look into and repair. After that, I heard nothing more and that was in early November. I sent two follow-ups at that point and my tracking system shows they were read many times. And absolutely nothing, and I’m not alone with that. Once Lennar comes in and inspects and finds out the issues are very severe, they just go silent. Lennar blocks them on social media, they don’t return calls, they don’t return emails. I’ve experienced that not once but now twice and again with very senior executives at Lennar. There is nothing they could do to make me happy because – it may sound dramatic but it’s absolutely true – this has been the most traumatic experience I’ve ever gone through – and there is a lot I’m leaving out here because we don’t have a lot of time. The least they could do is buy my house because even if all of the repairs are made, I still likely have to sell well under what I owe for the house even though I ‘technically’ have several hundred thousand dollars in equity. Plus – and this is where consumers really need to understand – there are simply no protections – from an attorney general perspective or any of the things we are used to. I have spent close to $100,000 in attorney fees to get absolutely no resolution whatsoever. They should pay for my attorney fees. That would be a start but it’s still not going to make me happy. That will get me to a point where I can simply move on with my life and that’s all I want to do at this point. 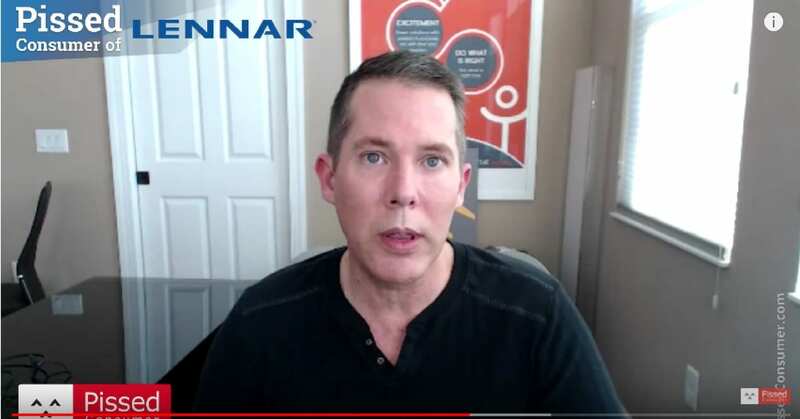 In part 2 of my Lennar review, I talk about the lack of consumer protections when you buy a new construction home by Lennar.